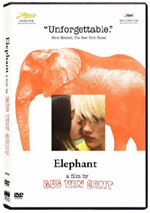 Winner of the Palme d'Or and Best Director prizes at the 2003 Cannes Film Festival, Gus Van Sant's realistic drama Elephant takes us inside an American high school on one single, ordinary day that very rapidly turns tragic. The story unfolds with class work, football, gossip and socializing. It observes the comings and goings of its characters from a safe distance, allowing us to see them as they are. With each student we see high school through a different experience, a new lens. These experiences range from friendly and innocent to traumatic and deeply disturbing. Elephant demonstrates that high school life is a complex landscape where the vitality and beauty of young lives can shift from light to darkness with surreal speed. It's an ordinary high school day. Except that it's not. $93.356 thousand on 6 screens. After the big commercial and critical success of 1997’s Good Will Hunting, Gus Van Sant seemed poised to become a major mainstream director. However, he immediately shot himself in the foot with the universally reviled Psycho ‘98 and then followed that up with the feel-good drama Finding Forrester in 2000. The latter did decently at the box office and earned fair notices from critics but didn’t live up to Van Sant’s peak success. From there the director retreated to quieter, more experimental fare like 2002’s Gerry and 2003’s Elephant. Set in an Oregon high school, much of the movie simply introduces us to students and their ordinary lives. We watch them wander the halls, go to lunch, attend classes, and all the usual stuff that fills a teen’s day. We also see some hints of more problematic issues, such as alcoholic parents, student-to-student abuse, and bulimia, but these don’t act as any form of focus. About 20 minutes in, we get a hint this won’t be an ordinary day, as Eric (Eric Deulen) and Alex (Alex Frost) wander into the school decked out in full military gear and touting weapons. We briefly flash back to see some of the nastiness heaped upon them by their peers, and we later get a look at what they did that morning. However, most of the movie focuses on the regular actions of the other kids, and these build toward the arrival of Eric and Alex as they embark on a shooting spree inside the school. As one who works with troubled kids in a school system, I’m always eager to learn more about those issues. I hoped that Elephant would provide an insightful exploration of teens and what happens during catastrophic events like Columbine. Unfortunately, the movie fell ludicrously short of those goals. Actually, I can’t claim that Van Sant really intended that. I can’t claim that I could figure out what exactly Van Sant wanted to do, other than to fill 80 minutes with the slowest-moving, most pointless material possible. This meant scene after scene in which kids go about their normal high school days during which virtually nothing of interest occurs. This means endless shots of kids as they walk the halls; Van Sant falls in love with never-ending tracking shots as we follow the students on their way from one point to another. Actually, I do think I understood Van Sant’s goals. The vast majority of the flick depicts the banality of life but also connects us to just how unremarkable things are within the setting. Most violent movies create a world of endless conflict and give us a grand scheme for events, but Elephant posits that bad stuff happens without warning. Sort of. Unfortunately, Van Sant can’t leave well enough alone, and he gives us some backstory on the shooters. One might think this will help broaden the movie and make it richer, but it has the opposite effect. It shows the possible roots of Eric and Alex’s maladjustment and oddly decides to make them out as potentially homosexual, a decision that can’t sit well in the gay community. We also see usual “negative influences” like violent video games, a depiction that feels like an easy way to “explain” their detachment from reality. The kids also watch Nazi materials, another simplistic method to convey their problems, and we see how the other students mistreat and taunt Alex. Rather than flesh out the story, these devices make it seem less substantial. If Van Sant wanted us to see this sort of violence as unpredictable and something that could happen at any time, he shouldn’t have attempted explanations. Maybe these stabs meant to illustrate possible warning signs so folks can keep an eye out for potential shooters. However, if being ridiculed by peers and playing violent video games labels one a potential killer, the schools are packed full of them. In Elephant, we find the emperor has no clothes - not even a G-string. The movie desperately wants to convince us it’s about something important and has a vital message to tell. Unfortunately, it consists of little more than 80 minutes of experimental nonsense. Or maybe 70 minutes of experimental nonsense, for the film’s conclusion manages to bring about something fairly powerful. Again, this seems to have been Van Sant’s point; when he finally breaks the tedium with some action, it stands out that much more starkly to the viewer. Unfortunately, the film still lacks a real point even then, and the climax just makes us even more frustrated by the monotony that filled the prior 70 minutes. Elephant pours on too much cheap symbolism, such as when we see clouds roll in ominously. (Of course here they roll in really slowly.) It also only touches upon easy subjects like picked-on kids, video games, and the ease with which Americans can buy guns. Ultimately, the film seems simplistic and pointless. Elephant appears in both an aspect ratio of approximately 1.78:1 and in a fullscreen version on this double-sided DVD-14; the widescreen image has been enhanced for 16X9 televisions. Only the fullscreen picture was reviewed for this article. No, that last sentence wasn’t a misprint; the 1.33:1 version offered the original aspect ratio, while the 1.78:1 cropped the picture. In either case, the image seemed fairly mediocre. Much of the problem stemmed from lackluster definition. Shots often appeared moderately soft and ill-defined. At times the movie took on better clarity, but more than a few examples of fuzziness popped up throughout the film. I saw no issues with jagged edges or shimmering, but some fairly prominent edge enhancement appeared; that factor likely caused much of the softness. Source flaws seemed essentially absent; other than a few specks, the image looked clean. Elephant went with somewhat stylized tones at times, as it veered from overblown colors to thin, monochromatic ones. The hues usually looked decent, though I thought they periodically came across as too thick and a little muddy. Blacks were fine, and shadow detail also mostly seemed clear and reasonably defined, though some shots seemed somewhat dense. Ultimately, the edge enhancement created most of the concerns, as it left us with a moderately soft image. Given the low-budget and low-key nature of Elephant, I felt surprised to find both Dolby Digital 5.1 and DTS 5.1 soundtracks. Given the low-budget and low-key nature of Elephant, however, I didn’t feel surprised to find they both sounded virtually identical. If any variations occurred, I couldn’t detect them. The soundfield was decidedly lackluster and occasionally muddled. The worst issues affected the delineation of speech. The movie used localized dialogue, but on more than a few occasions, the lines bled from one speaker to another and lacked good placement. Even worse, some scenes put the material in very odd spots. For example, when Nathan and Carrie chatted in chapter four, his dialogue came from the far right although he stood in the center of the screen and she was to his right! The rest of the track didn’t offer much of a soundscape. The non-musical audio all appeared to have been recorded on the set, which meant we got the ambience from the day and little more. Music showed passable stereo delineation and that was it. The surrounds played a passive role and added virtually nothing to the proceedings. Audio quality seemed acceptable most of the time but failed to deliver more than that. Speech was thin and somewhat tough to understand, mostly due to the recording situations. Effects were tinny and lacked range, again largely because of the way they were recorded. Music usually seemed fine, though one extended scene with piano music sounded substantially distorted. Maybe I’m coming down too hard on the audio of a low-budget indie flick, but I still found the soundtrack of Elephant to present too many significant issues to earn more than a “C-“. In a weird move, the movie’s minor extras show up on the flipside of this disc. Given their insubstantial length, I don’t know why everything didn’t reside on one side. Anyway, we find the film’s trailer plus an ad for HBO Films and a featurette called On the Set of the Film Elephant: Rolling Through Time. This 12-minute and six-second program presents a few soundbites from actors Alex Frost, Elias McConnell, John Robinson, Kristen Hicks, and Eric Deulen as well as some unnamed crewmembers. However, it mainly offers behind the scenes footage from the set. Like this film, this comes in a meandering manner without much coherence, but it gives us some interesting shots such as goofing around among the kids and the shooting of the spitball sequence. It doesn’t tell us much about the making of the flick, but given the loose nature of the project, its structure makes sense. The cinematic equivalent of a 1000-word book report padded by 980 “verys”, Elephant takes a long time to go almost nowhere. An experiment in pointlessness, the film wants badly to offer a rich and important examination of it subject, but instead it only tries the viewer’s patience. 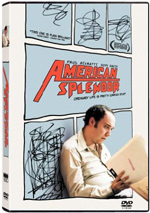 The DVD presents decent picture with flawed audio and almost no extras. Undeniably experimental and different, Elephant doesn’t succeed as much more than a test of endurance.